If you have any questions or want to enquire about dates, use our form to contact Annie Taylor. Annie’s simple stone 17th-century house is part of the fabric of the hamlet, clustered on a hilltop under the gaze of the 13th-century castle. Your warm, unobtrusive host gives you an apartment with its own entrance and plunge pool to share. Enjoy your morning coffee in a private sun-filled courtyard, then stone stairs lead to a tiny terrace with views, off which the studio lies, airy and light. There’s a kitchen tucked behind a pretty screen, dining table, open shelves stacked with brocante finds and two comfy chairs. Behind heavy linen curtains is the bedroom space, romantic and spacious. A chandelier hangs from a rough-hewn beam, and a new bathroom adjoins: pale limestone tiles, limed beams, a big shower and a bath. All is understated and suffused with light. Blissfully quiet too. Imagine sitting on the terrace and watching the hot-air balloons drift through the valley, or curling up and staying put on a wintery night. Parking is tucked into the village wall, so you can pop into lovely unspoilt Daglan for shops, market and restaurant ‘Le Petit Paris.’ Or stroll down to the village along the river – a lovely 40-minute walk. Annie must surely be the kindest and most helpful host in the whole of Sawdays! She seemed to know exactly the sort of places we would want to visit, and when we didn't want to leave her beautiful cottage (or rather the coolness of her rain-filled plunge pool; we were there when the temperature was in the high 30's!) we were made to feel completely at home. The Dordogne is beautiful, the crowds are avoidable and Les Tourterelles is definitely the place to stay! 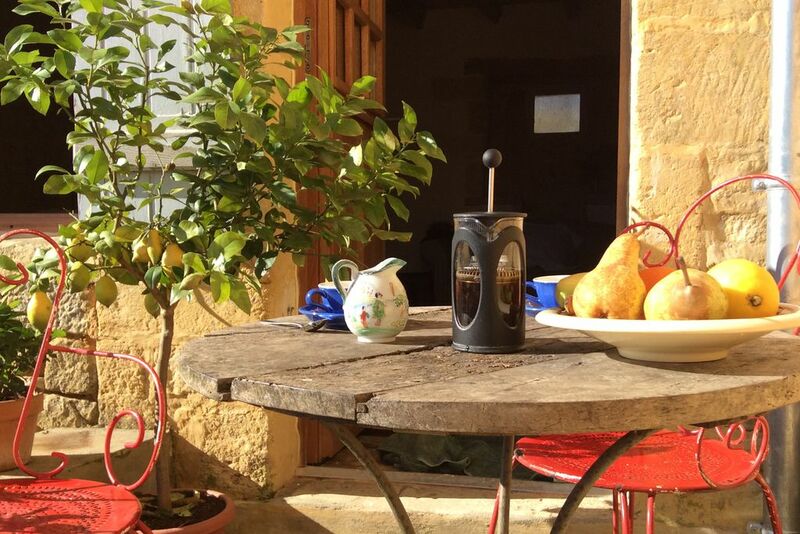 Les Tourterelles is the most delightful place to spend a week or two to get away from it all. Annie has made the apartment so beautiful, with lots of careful little touches. The bed is super comfortable and the bathroom is huge. There is so much to do and see in the area, but the best bit is coming back in the evening! Annie herself could not have been more helpful and friendly. Annie is the perfect hostess with the mostest. Could not do enough for us on our stay with her. Always asking if we had been here or there and giving great advice on the local attractions. As we were arriving later in the day she booked dinner at an amazing restaurant in Daglan for us that night. Spent many evenings having aperitifs before dinner with her. Accommodation was first class with everything there that you needed for a relaxing stay, including condiments, vegetables & fruit from her garden and use of her swimming pool. We highly recommend staying here and she is a wonderful host. We arrived to find a true piece of heaven. The cottage is simply charming and every detail is absolute perfection. For me it was amazing to arrive and find the cottage immaculate and spotless - I couldn't have asked for more. Our host was excellent 100% available but not intrusive. I particularly enjoyed waking up to the sunshine peering through the shutters and the sound of the cockerels echoing in the hamlet. We enjoyed relaxing walks and found plenty to keep us amused in the area. There are many attractions to suit all and great restaurants serving local cuisine. Thank you Annie. Annie was the perfect host. Her help and advice was invaluable, even from before we left home right to when we left to continue our journey! We had a thoroughly enjoyable, interesting and restful stay in Annie's beautiful home. The apartment is so well equipped and the beds so comfortable. The apartment is in an ideal location for visiting so many attractions in this beautiful part of the Dordogne. Merci beaucoup Annie! Les Tourterelles is a perfect base from which to explore the Dordogne’s medieval villages, vineyards, markets, chateaux and gardens. Distances are never far and the roads are stress-free. We found long woodland walks and paddled our canoe with dragonflies for company. We would never have found the local farmer’s homemade bread, or the magical night market at Bouzic without Annie’s advice. Nor would we have eaten at such wonderful restaurants. Such a spacious, comfortable and restful place to be, in a very friendly hamlet. Annie’s apartment in the tiny hamlet of Le Peruyzel is a great place from which to explore the area where distances are never far. Annie offered great advice so we were able to buy farm-made organic bread and book wonderful restaurants. Over 2 weeks, we explored medieval villages and towns, canoed the Dordogne, saw walnut oil being pressed and visited markets including a fabulous night market at Bouzic . We saw every garden in the area open to the public as well as seeking out vineyards and sampling Bergerac wines. All from a very comfortable studio with a welcome natural plunge pool. Annie is a perfect hostess, full of knowledge about the area, and concerned to make your stay really comfortable. The rain-water plunge pool is a lovely idea, fresh water with no chemicals and a life-saver on really hot days. The bed is very comfortable and the bathroom truly luxurious. This part of the Dordogne is full of interesting places to visit, and is so green and heavily wooded, it is delightful to drive around. Annie's house is very near the Dordogne river itself, with boat trips and so many chateaux to visit. And she knows the best places to eat! This little place is really beautiful. We thoroughly enjoyed our week's stay in this very interesting area. The little walled garden and natural pool is just perfect. We are a retired couple and loved the garden for afternoon naps and a cool-off on the pool. The owner is most helpful and full of helpful information. We would recommend this place. Les Tourterelles was a lovely apartment in a lovely peaceful setting. The apartment was the perfect base for exploring the area. The owner Annie was very helpful and gave lots of useful advice. I would thoroughly recommend this apartment for anyone wishing to visit the dordogne. In every way Les Tourterelles was the perfect place for us to rest for a week in the stunning Dordogne valley. Located just a few kilometres from impressively picturesque towns like Domme, Sarlat, La Roque-Gageac. and of course the beautiful Dodogne river. Annie was the perfect host - helping us find our way to those many special places, and making us very comfortable in her 17th century stone house. We had such a wonderful time with Annie in Le Peyruzel. She made us feel at home straight away and had some really thoughtful suggestions of the places we might like to see. The flat is beautiful and the setting spectacular, but Annie really made it that bit more special with her friendly advice and hospitality. We'd definitely go back. Fit for royalty this gorgeous immaculate apartment is tucked quietly away in a sweet medieval hamlet, yet so incredible close to all the wonders of the Dordogne. Light and fresh air fill the charming studio. Views from all windows are gorgeous. There is plentiful closet space and the bathroom is big enough to dance in. On hot days the little walled garden and refreshing rainwater pool were so welcome, though the apartment stayed cool. The bed was exceedingly comfortable. This was a superb retreat with a genrerous and helpful hostess. My one regret is that I had to leave this his paradise. Annie's beautifully appointed apartment in the tranquil hamlet of Le Peyruzel is the perfect base from which to explore the Dordogne. There is a sense of complete seclusion and privacy should you seek it - your thoughtful and charming host, Annie, is at hand with helpful suggestions if you ask her. There is access to a gorgeous rainwater plunge pool and the spacious, comfortable studio has been stocked with all the essentials for an ideal escape for two. We highly recommend Les Tourterelles and would return in a heartbeat. Le Peyruzel is a beautiful, charming, very authentic Village Perigourdin. Perched high on a hilltop bathed in sunshine, it overlooks wooded slopes once covered in vines. The Ceou Valley with miles of cycling tracks and its pristine river is nestled below. Many French people live full time in the village just as they have done for centuries. You'll find a working farm, walnut plantations, truffiers, acres of sunflower fields & poppies bordering the short drive down to the very pretty village of Daglan below. Dordogne- Beautiful, a perfect climate, 1001 Chateaux, Vineyards &Restaurants. Dome is 5 mins, 20 mins to Sarlat the jewel in the French Medieval Crown. Beynac and La Roque Gageac 15 mins along the river, dozens of beautiful towns and villages close by. Pamper yourself on your holiday- A new, King, superbly comfortable bed with French Linen dried in the sunshine. A choice of real Australian wool or synthetic pillows. A Huge bathroom with lots of fresh fluffy Bath towels, and a lovely big Bath with a view. There are lively markets every day just minutes away, casual restaurants where a 3 course lunch is so good for 12-15 Euros. A Michelin starred restaurant just down the hill (reserve a table), or enjoy an aperitif, cheese or glass of wine in the garden.